The garden of my budget-free dreams has many beautiful water features - curved Monet bridges, hexagonal pond decking covered with puffy recliners, waterfalls with secret water pumps - to mention but three. 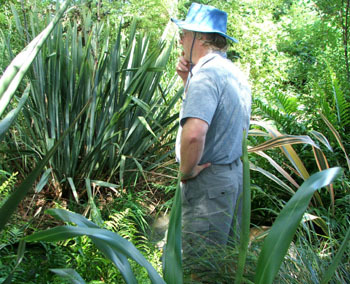 But in my real garden I'm rustic and recycled, and the proud owner-custodian of a waterwheel. Every minute of every day 30 cubic meters of water burble through my property in an irrigation canal, or water race. 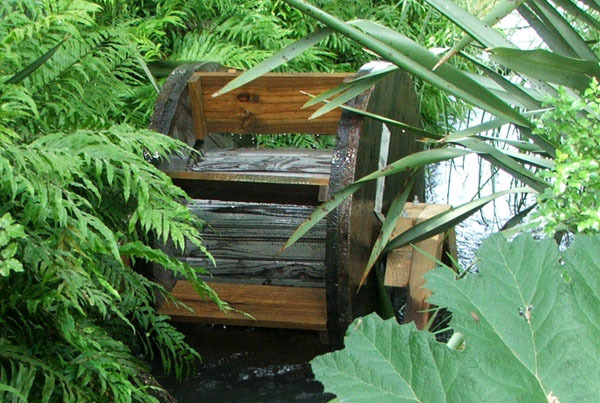 The waterwheel lurks in the water race, in a shady, secret place surrounded by green ferns, strong spiky green flaxes, and gunnera. Tall Wattle trees provide overhead shelter. Rooster Bridge, which crosses over the water to the Hen House Gardens (and the hens), provides the prime viewing and listening spot. 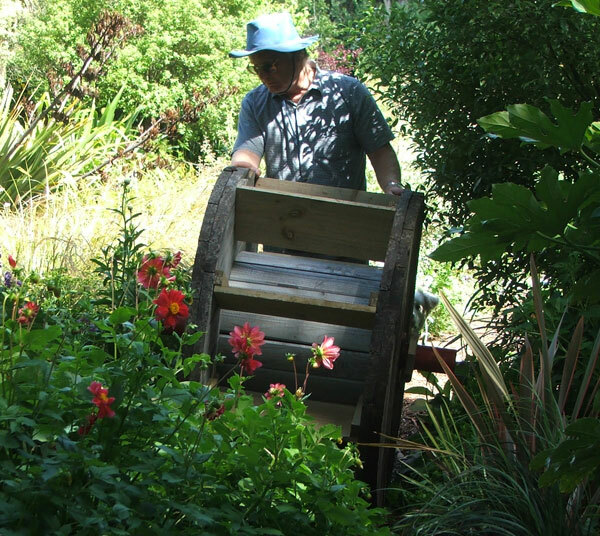 The waterwheel sits on the race bed on a wooden mounting, swishing and whooshing around and around - a piece of true water-magic. It uses the flow to raise buckets of water which tip out and feed a little woman-made stream. The power of water is used to raise water - it's a neat energy concept. After much googling and thinking the waterwheel plans were drawn up, recycled parts were sourced, and construction began in earnest - well, actually in the Moosey garage - by the Moosey Resident Design Engineer. A month of muffled clangings and bangings followed, the garage light burning late into the night. Well, sometimes! The finished waterwheel was lowered into the water race a month ago. Hearing the noises of the paddles sloshing around, watching the spill of water from the plastic buckets - it was a deep and memorable moment. And there've been many more such moments! The first week, on waterwheel alert, I checked many times each day to see that the wheel was still turning. One day - shock, horror - a plastic bucket had ripped. And then the unthinkable - the wheel had stopped, a chopstick-sized twig caught up in a paddle. Eek! 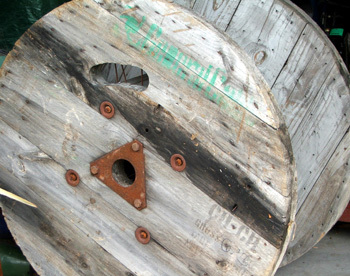 In the spirit of recycling, a cable drum forms the main part of the waterwheel. The shaft was found in a demolition yard, paddles and mounts are built from new wood, and the water which feeds the stream is channelled initially into some house guttering. Stainless steel buckets have now replaced the inferior plastic buckets, but friends and relations coerced into buying lots and lots of three litre plastic milk containers have not been told yet. Oops. What are friends for? 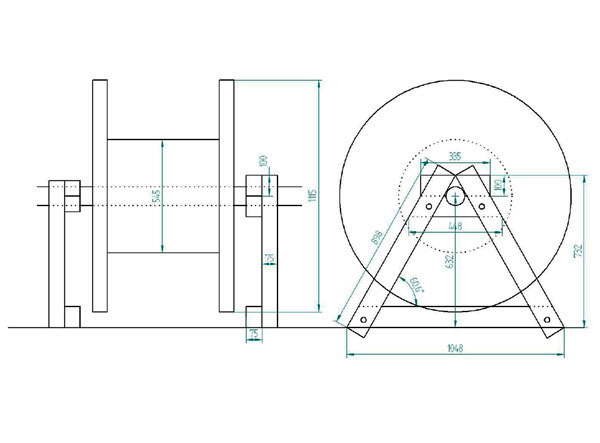 Anyone wanting help in building their own waterwheel needs less of the ramble and more of the technical. The wheel was designed and built by Non-Gardening Partner, an engineer, whose job it is now to fix things and solve any ongoing problems. Here's the plan.